Virginie Jamin, who has created a name for herself with such wildly popular designs as "Belles du Mexique", dreamt up a story of a woman who leaves India on a boat without suitcases or memories. All she carries with her is a light, sparkling necklace of Indian pearls. Swayed by the tumultuous waves, she starts spinning in circles in a sort of hypnotic dance. Her necklace twirls in time and appears to be actively participating in this unique choreography. The movement of the pearls draws her into an intoxicating whirlwind. The necklace that offered her the most beautiful dance of her life comes undone at one end, sending the pearls rolling, spreading loose, being engulfed by the sea. All that remains of this magical moment is a single pearl, which she wears every day, because it brings her a peaceful sense of happiness. The design instills a surprising sensation of movement. The pattern is pretty busy; yet, I consider that the scarf should be worn so as to display in a bigger proportion than others the pattern, to communicate its message clearly. A headscarf would be a wonderful fantasist manner. 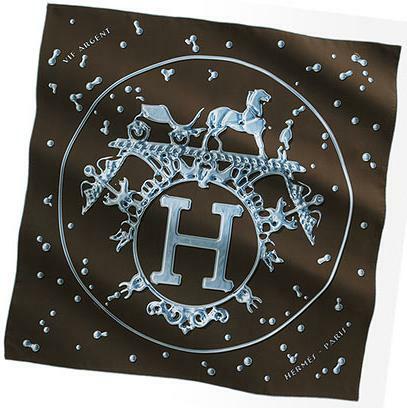 This scarf, designed by Aline Honore and issued in 2009 as part of Hermes' Indian theme, pays tribute to the infinite creativity in textiles - in terms of fabrics, patterns and colours. One of the many riches of India, fabrics - whether cotton or silk - come in a variety of styles: simple, ornate, printed, woven, embroidered and sequined and in countless imaginative patterns: floral, folk, geometric, abstract ..... "Coupons indiens", carrying us to a fabric strand at an Indian marketplace, lends the fabrics a tactile feel suggesting fluidity and suppleness. Coupons indiens is a hymn to the colour, with its numerous tints - all produced from natural pigments. Colour is everywhere in India, vibrating with strength, brightness and a rich palette. It illuminates women's diaphanous, elegantly draped saris. It crowns men with dazzling turbans. Its symbolism adds a certain rhythm to life: red for joy, yellow for its promise of happiness, the sheer serenity of pure white. With so many designs and colours, which one would you choose? 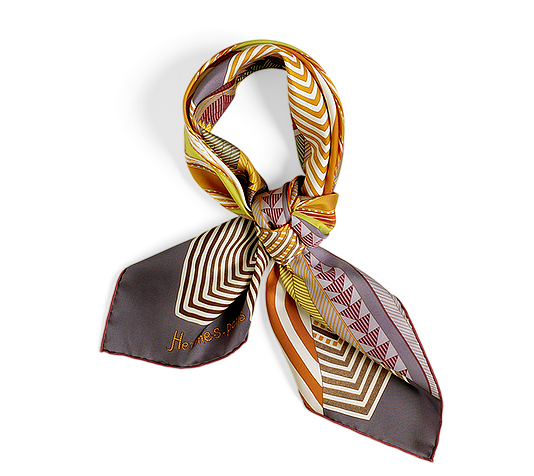 This scarf ties wonderfully, as the richness of the design instills a natural sophistication to the person who wears it. Perhaps even more impactful is the larger size variation of this scarf, in cashmere and silk, which allows the wearer to wrap it around the neck while the edges display, in all their splendour, the richness of the pattern. 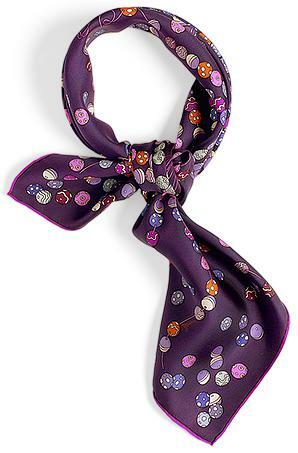 A true visual celebration, the scarf's vibrating character transcends the fabric to define the wearer beautifully ! An interesting design by Dimitri Rybaltchenko, "Vif Argent" ("Quicksilver") depicts drops of mercury that form, by way of continuous lines, the famous Hermes brand. 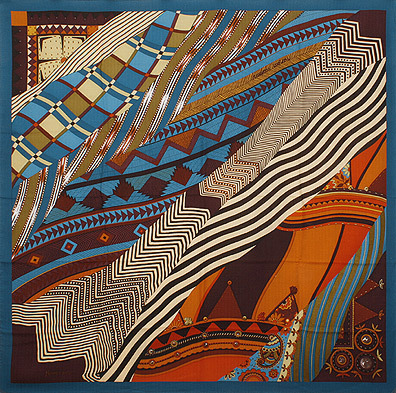 It is a stirring design, beautiful in its simplicity, but one that does not have a particular impact when knotted traditionally around the neck - unless a good part of the middle design is displayed, as in a headscarf fashion, or perhaps in a knot where a good quarter of the scarf is displayed in front. In French, "Tohu Bohu" means tumult, commotion, so "Hurly Burly" would be an appropriate translation. 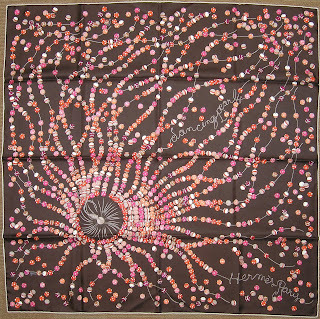 This scarf, first released in 2004 and reissued in 2008 and again in 2010 on cashmere/silk, features concentric circles, each of a different colour, starting in the middle of the scarf and increasing in size until the largest circle becomes inscribed within the scarf. Within the widths of select circles are inscribed, one per circle, the letters that make up "Hermes". Each of the corners depicts one element of the address of the Maison's Faubourg St.-Honore flagship boutique - "24", "Fbg", "Paris" and "France", each word having its letters in disorder (the other definition of "tohu bohu"). Finally, the very edge of the scarf features the many colours that have been already included in the design, in a sequence, similar to that of the Human DNA, that's harmoniously playful and adds the extra element of surprise and "fun" when the scarf is worn. 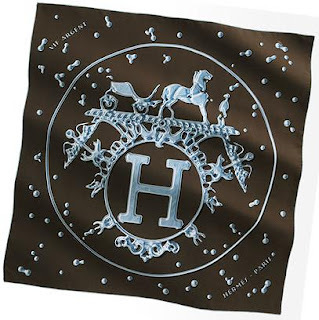 The design was created by Claudia Stuhlhofer Mayr, a very successful designer - and the only Austrian designer in the art team of Hermes for twelve years. 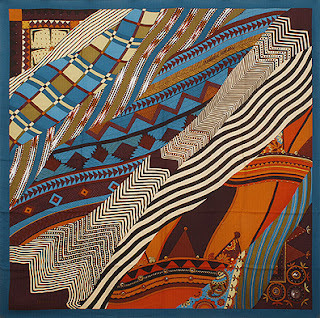 This pattern was an instant success with fans of Hermes, including the most renowned Italian singer of all times, the late Luciano Pavarotti (seen here wearing the orange GM version - "grand modele", or "large size-XL" - in cashmere/silk blend). 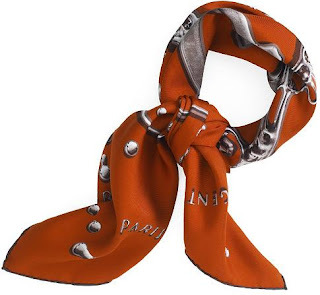 In response to such popularity, Hermes has further satisfied the public's thirst by adapting this design for jewelry and household items such as porcelain, themselves very popular items and sought-after collectibles.